In one paragraph describe why Phnom Penh already has the ‘seeds’ to be combat the challenge or rapid urbanization. In terms of “City is a living being and ecosystem”, it is a really good way to look at it. I am agreed that, mix-used organism is a priority and functional strategy to develop a city. The intersection of my idea and hers is that, The city should grow naturally as the way it is should be. As long as it is full-fill the people needs and follow the city’s infrastructure that would be a good place to live in. About the high density and overcrowding of people in a city, it’s has their advantages and disadvantages. Jacobs has pointed out about the idea of vibrant community, but we need to keep in mind that with high density of people comes with high risk and more responsible and management regarding the people in the area and the authorities. Phnom Penh already has the “seeds” because it grows by no rule at all. Most of the commercial building are built randomly according to need of the people even it has a negative effect to the neighborhoods. Therefore, Phnom Penh is a place that mix of all kinds of building with different function. This unplanned development has its good advantages and disadvantages. The main advantage is that, the people easily to get access for their needs by not to travel very far and they have a lot of options. The main disadvantage is that, growing without any rule like this, the negative effect has point to the neighborhood or the people surround that area (ex: Karaoke Club is built in front of the high school, or a Noisy restaurant is built in the middle of the residential zone). 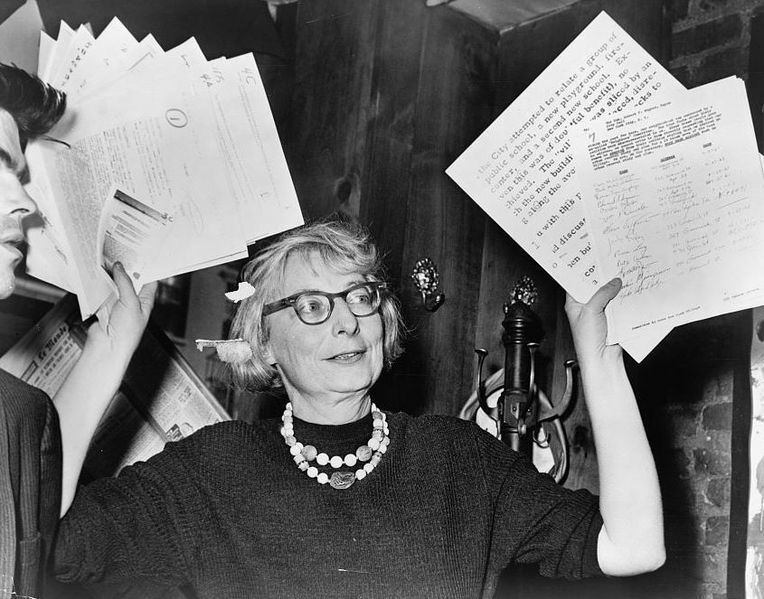 The observations that Jane Jacobs had on how cities should evolve need to be looked at in the context in which she was writing them. In 1961 the world population was approximately three billion, less than half of what it is today. She was seeing large cities that, in many parts of the world, were rebuilding after the decimation caused by two world wars. She also saw the modern building movement in full swing. While the Bauhaus and the Chicago school had begun this phase decades previous, the post World War II era saw the large scale implementation of these design ideas. It would be very interesting to see how she felt about her ideas circa 1978 when suburbia had overtaken America and many of the buildings constructed in the le Corbusier style had lost their sheen. I do agree with many of her ideas though. It was outside planners building Eisenhower’s great highway system that literally tore apart many of the great cities of America. Had local community organizations been allowed more say in the planning of the highway system perhaps we wouldn’t have seen such a decline in American cities in the 60s, 70s and 80s. And perhaps more buildings of worth would be standing yet today. Phnom Penh is at the same crossroads today with an expanding economy and the need for much improved infrastructure. While I know that communities are vital to the conversation about what happens to the city I can not discount the insight that professional urban planners can bring. The key is in organizing. Not when buildings are being torn down, people being displaced or midway through a major project but immediately. Every Sangkat needs to put together a locally elected, non-partisan body that works with the government in planning changes. While this is sometimes a laborious endeavor, rash decisions rarely make for better building. The key to building a vibrant successful Phnom Penh is having its residents be involved in the process. Phnom Penh, is a capital city of Cambodia, it has a high density of people with a high economy and infrastructure. Buildings (residential and commercial), streets, parks, neighborhoods, government and economy are function together. Although, it is a little bit crowding, but it also makes the city’s economy grow faster and provides a good opportunity for people to working or making their own business. Moreover, differences of businesses and foreign investments also come over by this high density. Although a lot of problems will caused by this crowding city, but a lot of solutions will come over too to combat all of difficulties and make the city develops much faster. Phnom Penh is the lively, diverse, intense city. People from different ages and social group play their role day and night. Young generations has strong passion of learning, middle ages try very hard to do economic activity. Local people run their business with local product and technology, but also not hesitate to import new product. There are huge amount of foreign funds to invest in Cambodia, and it surely develops Cambodia dramatically with new type of employee system. It is obvious Phnom Penh is holding the “seed” to move on for better future and Phnom Penh will take a label “Pearl of Asia” in the past again. Does Phnom Penh have its own seed of resilience? Well the answer is very simple, is that as a developing country the city develops according to the demand of the people. The city expended to where people can live and with the undying idea of everyone can own a small business and the hate of importing brand. The people had enough of the importing material they starting to believe they can create their own fast food, brand cloth, snacks. These things is happening its growing due to “the nation’s pride” so as long as that spirit still flow and the belief of being independent from import material still exist Phnom Penh will grow into it own little unique city where everything is made by the people for the people. (That include architecture as well but there isnt a real solution that can appeal to every Cambodian).